Kings Cross Surgery, one of the latest additions to the AT Medics portfolio of primary care sites, achieved a very significant increase in flu prevention for “at risk” patients in particular during their first 12 months of managing the surgery, as part of their focus on high standards of patient care. Flu can be unpleasant, but if you are otherwise healthy it will usually clear up on its own within a week. However, flu can be more severe in certain people, such as anyone aged 65 and over, pregnant women and both children and adults with an underlying health condition (particularly long-term heart or respiratory disease). 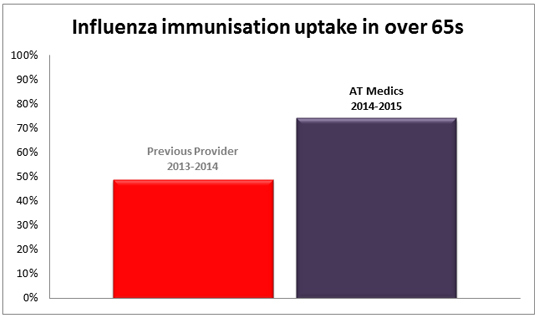 The team at Kings Cross Surgery worked hard to raise awareness to their patients; administering flu vaccinations to 74% of patients aged 65 and over compared with just 49% the year prior under the previous management, reducing the risk of flu for this vulnerable age group by 25%. This achievement is well above the national average. AT Medics added Kings Cross Surgery to its portfolio of practices in May 2015, having successfully delivered an outstanding caretaker management contract for the prior 12 months.